In this installment of my series about DUI in local, Macomb County District Courts, we’ll turn to the 42nd District Court 1st Division in Romeo. Handling DUI cases from Armada, Armada Township, Bruce Township, Memphis, Ray Township, Richmond, Richmond Township, Romeo and Washington Township, this Court is most often simply referred to as “Romeo.” Given the laundry list of Municipalities that in covers, we’ll adopt that abbreviation. Thus, when we talk about the “Romeo” Court, we mean the 42-1 District Court in Romeo, but can be referring to a case arising in any of the Cities or Townships mentioned above. Depending on where you live, this Court can either be really local, or really far. Located on 33 Mile Rd., it represents the northern-most reaches of geographic Macomb County. The Court itself is rather modern. The Court Staff is friendly, and really brings to mind a less big-city, and a more helpful, small-town type of character. The Presiding Judge, Denis LeDuc, came to the Bench as a long-time veteran Macomb County Lawyer. Smart and hardworking, Judge LeDuc’s intelligence and work ethic is only exceeded by his actual concern about those who appear before him. This man really wants to help people. For anyone facing a DUI, that can represent either side of the coin, and be either a good thing, or a bit of a pain. If a person is properly prepared and represented in a DUI case, it is possible to emerge from this Court, at least in a 1st Offense Case, with only the payment of Fines and Costs, and no Probation or any other kind of follow-up. On the other hand, a person not well represented or prepared, or whose case presents difficult circumstances (like being a DUI 2nd Offense), may wind up on some rather intense Probation, and be subject to Classes, Treatment, and Alcohol and/or Drug Testing ranging from infrequently to almost daily. Like most Judges, Judge LeDuc tends to follow the written Recommendation of the Probation Department. In other blog articles, I have explained the DUI process in detail, so here it will have to suffice to simply observe that anyone facing a DUI must, prior to being Sentenced by the Judge, undergo a mandatory Alcohol Assessment Test. This is required by Michigan Law, and is administered by the Probation Department for whatever Court is Hearing the case. As part of this process, the Probation Department schedules an interview with the person, and collects some rather detailed biographical information about them. At some point there is both an in-person interview, as well as the taking of the actual Alcohol Assessment Test. This is a written test, which is “graded” by a numerical score. The higher a person scores, the worse they’ve done, whereas the lower they score, the better for them. Anyway, the end result of all this information-gathering, interviewing and testing is the legally-mandated Sentencing Report. Based upon the person’s Alcohol Assessment Test score, as well as the other information presented the Probation Officer, a Recommendation is made to the Judge advising what kind of Sentence should be imposed. As I have pointed out in other blog articles, this Recommendation is, in almost every Court, more or less a “blueprint” for what the Judge is going to do, and can fairly well considered the script for what’s going to happen. Judge LeDuc is a bit old-school in this regard, and that’s a good thing. 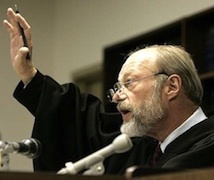 Whereas the more modern trend is Judges who tend to exhibit far too little independent thought (and too little “spine”) to make any decision not suggested to them, and basically follow the Probation Department’s Sentencing Recommendation to the letter, Judge LeDuc, while mindful of the Probation Department’s expertise and role, does not lose sight of the fact that he is the Judge, and that it was him, and not those under him, who was elected to make the final Sentencing decision. That doesn’t mean that anyone can or should expect any radical departure from what’s recommended in any given case, but it does mean that a favorable recommendation can be made into an even more favorable outcome, and some less-than-ideal recommendations can be trimmed back a bit if the right appeal is made to the Judge. In terms of DUI’s this means that a 1st Offender can, if things are handled properly, avoid most, if not all of the mess of Reporting Probation and Classing and Counseling and Testing. Of course, this also means no Jail. Judge LeDuc is not a “Jail-happy” kind of Judge, but he will hesitate far less than most others in locking someone up who he thinks deserves or needs it. This means little room for error for anyone who is on Probation to him. In a 2nd Offense DUI, Judge LeDuc is typically inclined to give out a Jail Sentence right out of the gate – but, and hold on here – he can, and in most cases, usually is persuaded, by strong Legal argument, to Suspend it. That means, for example, that a person may be Sentenced to 45 days in Jail for a DUI 2nd Offense. Instead of locking them up right away, however, Judge LeDuc can be persuaded to hold off on that while they complete a term or Probation. If the person does what they’ve been Ordered to do, and doesn’t do anything they’re not supposed to, then the Jail Sentence is canceled. However, if they screw up, then they know that any punishment they get will start with the 45-day Jail Sentence that’s been Suspended in their DUI 2nd Offense case. The 42-1 District Court in Romeo is also one of the most expensive Courts in all of Macomb County. I honestly don’t know if the 41B District Court in Clinton Township Court, or the 42-1 in Romeo is more expensive, but in any event, they’re close enough to call a tie. From my point of view, and while I’m sympathetic to a Client’s plight, getting walloped on the Fines and Costs is just part of the process, and not anything that I can change, anyway. Sure, it’s great to pay less for the same thing, but let’s face facts, not many people do a “pricegrabber.com” search before deciding in which City they are going get popped for a DUI. Thus, facing a DUI in an expensive Court just goes with the territory. However, when the price is high, but the potential outcome equally good, or even better, then I still call that a win. Frankly, and as I pointed out in my article about the 41B District Court in Clinton Township, if I was facing a DUI, I’d rather get soaked for money and walk out the front door of the Courthouse rather than pay way less, but wind up in Jail. The 42-1 Romeo Court’s Probation Department is a bit unusual, in that, like the 41A Sterling Heights Court, it’s made up of genuinely decent people who seem to lack the stereotypical “Probation Officer Attitude.” That’s not to say they’re a bunch of greenhorns who don’t know what’s going on; indeed, they know every trick in the book. Instead, they seem to be willing to look at every Probationer as equally capable of doing well as they are of screwing it up. I’ve heard no complaints from any of my Clients about any Romeo Probation Officer being “unfair,” or anything like that. The Romeo Court is staffed by nice people, with a great Judge, decent and fair-minded Probation Officers. In that regard, it’s as good and lenient a place as any to have to deal with a DUI. It’s only real shortcoming is that it is a contender for the most expensive Court in the County for DUI’s. Not a bad trade-off, in my book. 4.4 for a First Offense. 4.0 for a Second Offense.